Enjoy some frozen yogurt with us for our “Yogurt with a Cop” event. Click on link for more information. 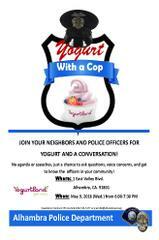 Join your neighbors and police officers for yogurt and a conversations!